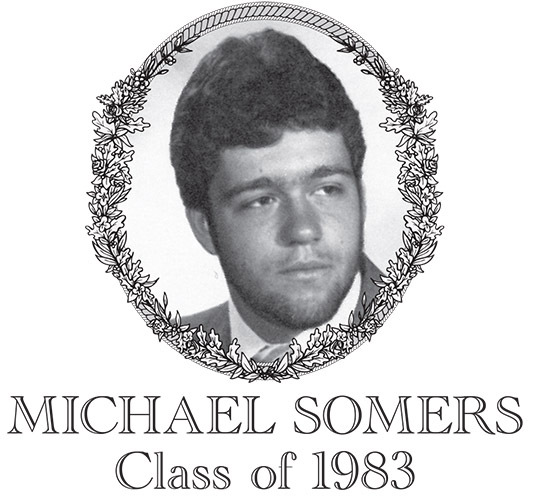 Michael Somers, Class of 1983, was a two-sport athlete at Bartlett High School. During his high school career, Mike earned 7 letters in football and baseball. As a freshman, in his first start at halfback against Millbury High School, he rushed for 163 yards and scored two touchdowns. After this performance, he was named the star of the week by the Worcester Telegram and Gazette. Mike would go on to receive star of the week honors two more times during his freshman year. The local press referred to him as the "Freshman Sensation." In preparing for his sophomore year, Mike attended a summer football camp sponsored by Coach Jim Healy. He got the attention of not only coaches, but also the pros who assisted at the camp (Tim Foxx, Andy Johnson and Mike Haynes) by running the 40-yard dash in 4.6 seconds. As his career continued, he was a dominant player both offensively and defensively. In his sophomore year, Mike scored the winning touchdown in the Thanksgiving Day Game, which finally broke the 10-year losing streak. Mike's senior year was action packed with intense performances and numerous awards. He was now starting as a defensive end and was credited with 28 quarterback sacks during the season. In the game against Southbridge, Mike had 14 unassisted tackles, a blocked punt and 2 quarterback sacks. Mike was awarded the Vincent J. Sabatanelli Award as the MVP of the game. Mike was also recognized by being selected to the Border Conference All Star Team and the Worcester Telegram and Gazette Honor Team. Mike's second passion was baseball. He earned three letters as a starter in center field and was Captain his senior year. Mike's best asset was undoubtedly his speed on the base paths, which made him a base stealing threat as well as a threat to take an extra base on any hit. He covered a lot of territory with his strong defense in center field and was one of the fastest center fielders Coach Bob Pepka ever coached. As a hitter, Mike had the ability to spray the ball to all fields. Mike ended his Bartlett career with a career batting average of .280. Mike will always be remembered as a great competitor who always tried his best, gave 100% with a great attitude, and was well respected. Mike currently resides in Webster and has his own landscaping business. He has two children Jacob Robert and Michaela Violet.